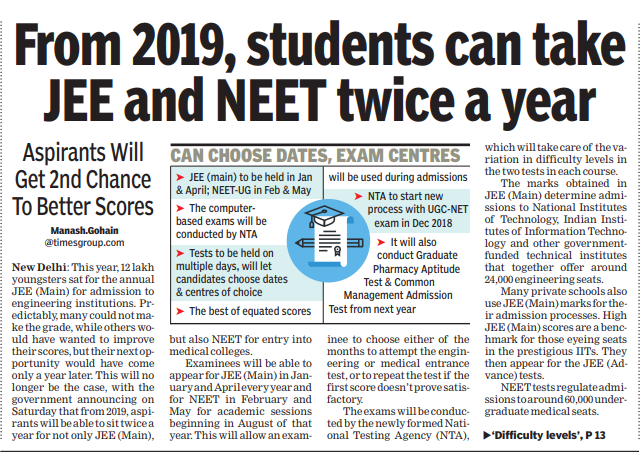 JEE & NEET twice a year! Union HRD minister Prakash Javadekar announced recently that the competitive exams like NEET, the gateway to medical and dental colleges across the country and JEE Main, for admission into engineering colleges will be conducted twice a year. • JEE Main exam will be held in January and April while NEET will be held in February and May. • The exam which was originally been conducted by the CBSE board will now be driven by the newly formed examination conducting agency, National Testing Agency (NTA) single handedly. • NTA plans to use tools like artificial intelligence, psychometric analysis and computer based adaptive testing. Where the candidates will be taken to next level once they are through with the easier questions to change the way exams are conducted. • Millions of questions will be prepared instead of 2 to 3 papers for a particular test. • The tests are 100% safe. The highest level of encryption will be used so that no one can hack the system. The NTA will annually test around 1.5 crore candidates single handedly. • There will be a softwares algorithm picking questions at random for the test at a particular date based on the set difficulty level. • The syllabus, question format, language, and fees won’t change. Each exam will be conducted on four to five dates. • In case a candidate is not happy with the score, the candidate can reappear for the next exam and the best score will be considered for further process to admission in colleges. • The NTA is planning to set up nearly 3000 centres to let JEE Main and NEET 2019 aspirants practice computer based test free of cost from August 2018. It will also launch a mobile application to help them locate and register themselves for the centres. “Change is the only constant.” Now, what’s left is to wait and watch how this promising looking change creates progress and surely, takes large strides forward in the IT world! 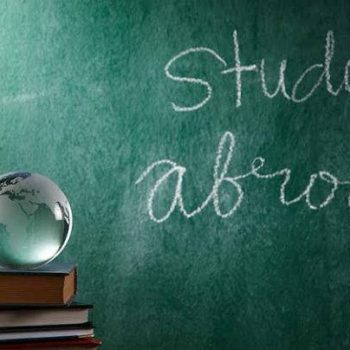 Why do STUDENTS prefer to Study Abroad over Indian Institutes?